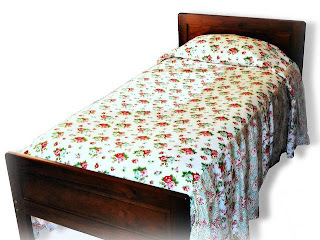 Earlier this year, when I made this bed cover as a gift, I learned a number of important things about fabric and bolts. For example: I learned that you can't waltz into your local purveyor of fine fabrics and request 11 metres of their best. No siree. Apparently your standard bolt in a patchwork store is liable to hold far less. And you will need to buy shorter pieces of different prints and do something called sewing to join them into a bed cover. Just between you and I, I've heard that some people do this kind of thing just for fun. Sheesh, it takes all kinds, huh? But more importantly, I learned that a bolt is actually something your 4-year-old is liable to do whilst you are puzzling (in the aforementioned fabric store) over which prints go together and in what combination and quantity. Yes, this sort of bolt compels you to run up and down the aisles, with eyes wide and bellowing your child's name like a fishwife. The sort where other customers are liable to look and think ... Sheesh, it takes all kinds, huh? Love your humour.....yes, a few years back I was asked - "why do you buy fabric, only to cut it up and then sew it back together again...."what the.." true, but it does make some interesting combinations. I hear you! In fact, you've probably heard me, as I've been shouting, "Charlie!" in every shop from Chadstone to the City for a couple of years now. Thank God he's off to school next year so everyone's ears can have a rest. at least she wasn't pretending to be a dog and crawling all over the ground with many many many old ladies telling her to be careful of pins. I had a 4 year old in a fabric shop a few years ago, defiantly dressed as a covered from head to toe superhero on a VERY hot summer day. He overheated, stripped to his jocks and had a screaming tanty all within 5 minutes of entering the shop. Conclusion: superheros and fabric shops don't mix! Making a bolt for the door.